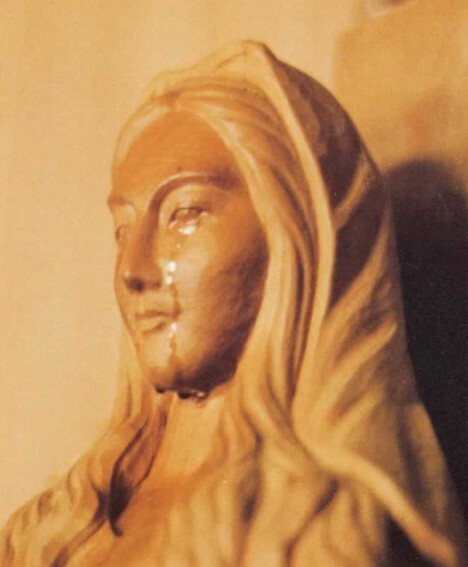 This 1979 photograph shows the teary-eyed Our Lady of Akita statue at the Seitai Hoshikai (The Institute of the Handmaids of the Holy Eucharist) convent in Akita prefecture. In January 1975, 12 years after a local sculptor carved the statue from the wood of a Japanese Judas tree, it began to cry. Over the next 6 years, around 2,000 witnesses reported seeing the statue weep 101 times. The quantity and frequency of the tears varied each time -- sometimes the statue cried a few times per day, and sometimes it went months, and even years, without crying. The statue, which is still housed at the Akita convent, shed its final tears in September 1981. Wow, it's amazing what an eyedropper can do. Abelive is a belive we are always right..
thanks for the comments from you all. Me and my Family have visited the Crying Lady of Akita years ago and wanted to comeback with a couple of our friends. Do you have any program for such short time visit? Accommodations available? How about tour packages? Will appreciate suggestions by way of immediate reply. I visited the crying lady of Akita, but she did not cry when we were there. It's an amazing phenomenon. It happened all over the world! I know its not a prank! Seriously! Who in the right mind would travel around the world to pour blood on statues? IT JESUS PPL! or in this case...MARY PPL! The religious masses are naturally gullible anyway. Just pay a few people to claim they saw the statue crying, snap a few pictures with strategically placed water dripped below the eye, and Wham, thousands of people will empty their wallet in hopes of witnessing a so-called miracle. The only real miracle is why people keep believing this bulls#!t. It's a tourist trap, a way of bringing commerce to their little burg. I think I'm gonna start making people believe that my lawn gnome is crying, or maybe my teddy bear. Praise Jesus. God is great worship him! I was just turning the pages of a Bangla national daily. Now a day, I don’t like to read the dailies, it is full of big lies of hypocrite politicians or news of murder in Bangladesh or in abroad, unethical criticism of the opposition against the ruling party or some promise of the ruling party to the people which will never be accomplished. News catches my eyes under the caption “The statue cried”. It makes me interested and surprised too. I some time think, but don’t get any reply. What would happen to Mary, Jesus, Muhammad if they would have to live in present society?